The Cannonball Express jet engine-powered dragster, driven by K.C. 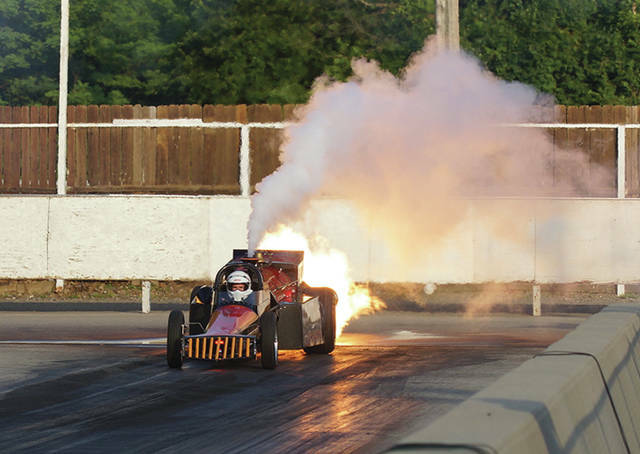 Jones of Van Nuys, Calif., lights up the starting area at Kil-Kare Dragway during Thursday’s June 29 Night of Fire drag racing exhibition in Xenia. Rich Hanna carefully packs the right drag parachute on his First Strike jet-powered funny car, prior to his first run over the 1/8-mile Kil-Kare Dragway drag strip, Thursday night June 29 in Xenia. Hanna and teammate Ken Hall have traveled all over the country doing jet drag racing exhibitions, but they consider Kil-Kare and the proximity the drivers have to the crowd as one of their favorite venues. 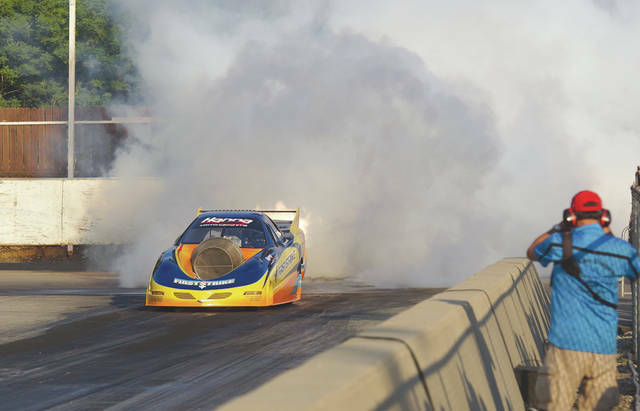 Barb Slone | News-Current The Strike Force Jet Funny Car, driven by Rich Hanna of Enfield, Conn., does a flaming burnout prior to its evening run as part of Kil-Kare Dragway’s Night of Fire drag racing exhibition, Thursday, June 29 in Xenia. XENIA — Rich Hanna drives his jet engine-powered First Strike funny car at 20-25 weekend drag racing exhibitions each year, but the experience at Kil-Kare Dragway is a unique one that he looks forward to each time he participates in the annual Night of Fire drag racing exhibition. Hanna, 44, races with Hanna Motorsports teammate Ken Hall, a 47-year-old Parker Ford, Pa. native who drives the Top Secret jet engine-powered funny car. The two grew up in racing together, watching their dads race Altered Gassers and dragsters. They’ve been racing jet funny cars together for nearly 20 years now. Hanna says whether the team is racing on a shorter 1/8-mile track like Kil-Kare or a longer 1/4-mile track, safety and care is put into every run. He packs his dual parachutes himself. Hanna is the jet-powered funny car World Speed Record Holder with a top speed of 295.08 mph. He’s the only jet-powered funny car driver to turn runs in excess of 290 mph, a feat he’s done three times. Cars full of racing fans were lined up 20-30 deep waiting to still get into the Kil-Kare Dragway grounds, as the first Night of Fire exhibition runs took place before sundown. Parking spaces grew tough to come by as fans swarmed the Kil-Kare grounds. An estimated capacity crowd of 2,000-3,000 race fans enjoyed the evening’s festivities. Kil-Kare’s annual Night of Fire drag racing exhibition provided jet-powered funny cars like the Hanna Motorsports duo, the jet “trains” of Californians K.C. and Linda Jones, plus four alcohol-powered funny cars from the Great Lakes Nostalgia Funny Car Circuit. Dayton area driver Eric Larson made passes in his Boss Bird nitro-powered Pontiac Firebird funny car, and Australian transplant Bazz Young drove his Down-Under Thunder Chevy Camaro SS funny car. Junior dragsters and several other classes of drag racers were also on hand to run Test & Tune runs. https://www.beavercreeknewscurrent.com/wp-content/uploads/sites/49/2017/07/web1_ChooChooJet_PS.jpgThe Cannonball Express jet engine-powered dragster, driven by K.C. Jones of Van Nuys, Calif., lights up the starting area at Kil-Kare Dragway during Thursday’s June 29 Night of Fire drag racing exhibition in Xenia. https://www.beavercreeknewscurrent.com/wp-content/uploads/sites/49/2017/07/web1_RichHannaChute_PS.jpgRich Hanna carefully packs the right drag parachute on his First Strike jet-powered funny car, prior to his first run over the 1/8-mile Kil-Kare Dragway drag strip, Thursday night June 29 in Xenia. 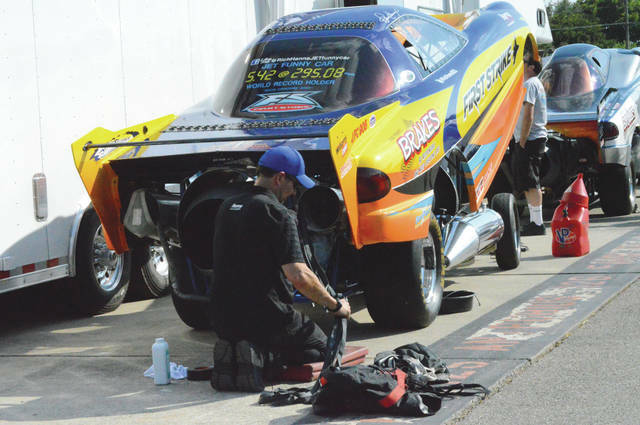 Hanna and teammate Ken Hall have traveled all over the country doing jet drag racing exhibitions, but they consider Kil-Kare and the proximity the drivers have to the crowd as one of their favorite venues. https://www.beavercreeknewscurrent.com/wp-content/uploads/sites/49/2017/07/web1_StrikeForceJetFC_PS.jpgBarb Slone | News-Current The Strike Force Jet Funny Car, driven by Rich Hanna of Enfield, Conn., does a flaming burnout prior to its evening run as part of Kil-Kare Dragway’s Night of Fire drag racing exhibition, Thursday, June 29 in Xenia. His ears might still be ringing, but you can try to reach John Bombatch at 937-372-4444, Ext. 2123.